By Trevor McIntyre: Tired of waiting endlessly for a rematch with IBF/WBA/WBO heavyweight champion Anthony Joshua, Dillian Whyte has turned his sights towards #1 ranked World Boxing Council contender Dominic ‘Trouble’ Breazeale (20-1, 18 KOs) for a potential fight in April or May if they can get the match negotiated. Breazeale expressed interest in fighting Whyte in an interview with Sky Sports News on Friday. Whyte, 30, was quick to respond by accepting the challenge, and saying that he would like to fight Breazeale in April or May in the UK. Breazeale would prefer the fight with Whyte take place in the United States. However, wherever the fight makes the most money will likely be where the match takes place. Even though Whyte isn’t a world champion, he’s a big pay-per-view attraction in the UK. Breazeale could make good money fighting Whyte. With Whyte-Breazeale being a potential PPV fight on Sky Box Office, it wouldn’t be surprising if Breazeale makes more money fighting him than he would WBC champion Wilder. The 6’7″ Breazeale is already the mandatory challenger for WBC heavyweight champion Deontay Wilder, but there’s no telling how long he’ll have to wait before he finally gets a shot at fighting him. Breazeale has been Wilder’s mandatory challenger since defeating Eric Molina by an 8th round stoppage in November 2017. If the WBC continues to draw it out before finally ordering the Wilder-Breazeale fight, it could put Breazeale’s mandatory spot in jeopardy, because he could lose to someone along the way. It makes a lot more sense for the Whyte vs. Breazeale fight to take place in the UK than it does in the U.S. Whyte is capable of bringing in large crowds in the UK, and he’s a big seller on Sky Box Office. What we don’t know is how serious Whyte is in wanting to fight Breazeale right now. Whyte is all over the place, talking about wanting to fight 42-year-old Wladimir Klitchko, and Anthony Joshua. 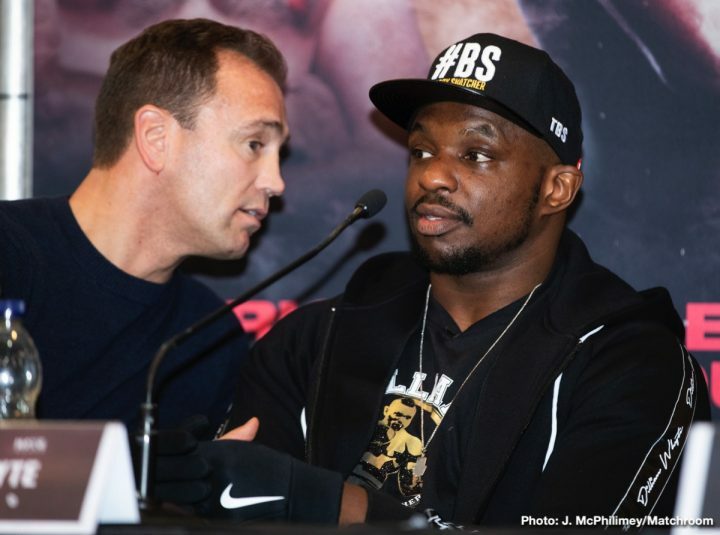 Whyte talked about Luis Ortiz recently, but then he turned around and took arguably a weaker opponent in Dereck Chisora to fight last December. Breazeale is a potentially tough fighter, who could beat Whyte if he performs like he did in his last three wins over Carlos Negron, Eric Molina and Izuagbe Ugonoh. Whyte wants to be the mandatory for WBC champion Deontay Wilder, but it’s unclear if that’s something that he wants as a bargaining chip to get a better deal for a fight against Joshua or if he really wants to fight ‘The Bronze Bomber.’ Whyte says he was given a “low-ball” offer for a fight against Joshua on April 13. Whyte says the offer was less than what Wilder and Tyson Fury were given to fight Joshua on that date. Whyte says it was even less than what Alexander Povetkin got recently for his fight against Joshua on September 22. Whyte’s promoter Eddie Hearn of Matchroom Boxing might not be in favor of him fighting Breazeale, however. Right now, Whyte is in position to evetually get a crack at Joshua in a big money stadium fight. Whyte could ruin that fight by facing Breazeale and getting beaten by him. It’s not beyond the realm of possibility that Whyte could lose to the 2012 U.S Olympian Breazeale. Whyte didn’t look so great in his rematch with Chisora on December 22. In fact, Whyte was losing on two of the judges’ scorecards by a 95-94, 95-94 score going into the 11th round, which was the round he stopped Chisora. Whyte was given two points by the referee, who looked like he was really on Chisora’s case the entire fight. It was one of those strange fights where a referee is paying attention to one fighter, and ignoring the fouling by the other. Given the large amount of two-way rough stuff from both fighters, the referee would have been better off just letting it go on rather than singling out one guy, and not doing anything to address the fouling from the other fighter. The way Whyte fought, he didn’t look as good as Chisora, and that’s a journeyman level fighter. Breazeale would have a very good chance of beating Whyte based on how he looked in that fight. Hearn would probably be averse to Whyte fighting Breazeale, in the same way that he was not in favor or Amir Khan fighting Terence Crawford. Whyte isn’t someone that you can guarantee a victory over Breazeale with 100 percent surety. That fight is more of a 50-50 type of match-up. Whyte should probably stay busy fighting a weaker opponent while he waits for an eventual fight with Joshua. It’s not worth it for Whyte to take a risky fight against someone like Breazeale. In the same way that Whyte has shown no interest in fighting Luis Ortiz for obvious reasons, he needs to realize that Breazeale is just as tough a nut for him to tackle than the Cuban talent. Whyte could lose just as bad against Breazeale. With a loss, Whyte would be out of the picture for a rematch with Joshua.